3. Contact Us: Reflects the options available to contact us if you need help or information. Carrington Mortgage is available to answer your call Monday-Friday, 8:00am–8:00pm, EST, or you can get answers on our website 24/7: www.CarringtonMS.com. 4. Bankruptcy Message: Provides statement of account Bankruptcy status. 5. Account Information: Provides an overview of the loan, including the property address, principal balance, interest rate, and whether there is a penalty for paying off the loan early. 6. Explanation of Payment Amount: Displays a summary of the payment amount, including principal, interest, escrow, past unpaid amount, and total fees and charges. 8. 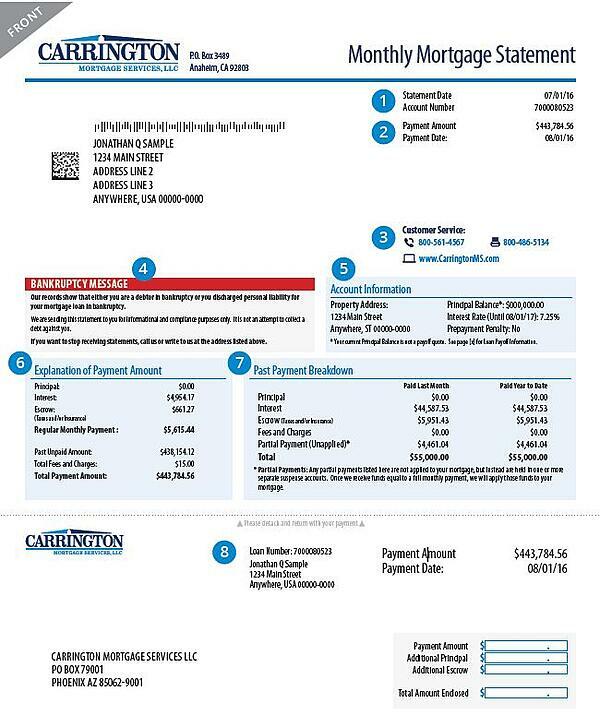 Payment Coupon: Provides loan information on a coupon that could be detached and returned with a payment. 9. Account History: Summary of recent account activity. 10. 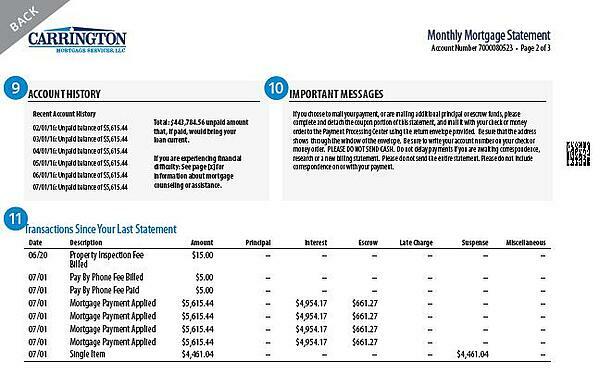 Important Messages: Lists important messages related to the status of the loan and payments. 11. Transactions Since Your Last Statement: Displays detailed information of fees and charges imposed and/or payments made since your last statement. Partial Payment (Unapplied/Suspense): Funds received that have not been applied to the account.